Members of the Auburn community are sharing two private fine art collections with visitors to Jule Collins Smith Museum of Fine Art, Auburn University. The museum will present “Between the Black and Caspian Seas: Antique Rugs from the Caucasus––Selections from the Collection of Larry Gerber” and “The Greatest Poem”––American Art in the Robert B. Ekelund, Jr. and Mark Thornton Collection” from May 23, 2015 to Sept. 6, 2015. 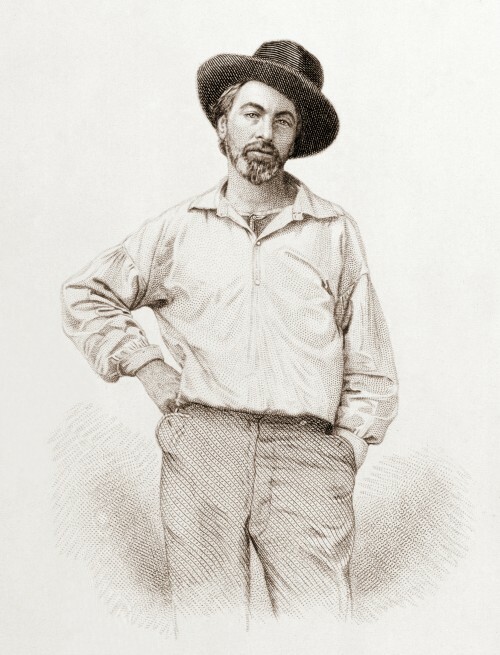 The quote used in the exhibition title of American art running concurrently is from the preface to Walt Whitman’s “Leaves of Grass.” Whitman proclaimed America itself “the greatest poem” in response to the activity of the late 19th and early 20th centuries, when the young nation began to find its own voice. “American artists at the turn of the century turned from emulating European modes to exploring new ways of artistic expression,” said Dennis Harper, curator of collections and exhibitions at the museum. “The Ekelund/Thornton collection reflects in many ways Whitman’s vision of America’s potential,” he said, siting an example by Edward Hopper, which draws attention to the common man, and another from Arthur Dove, showing the transition from realism to abstraction. 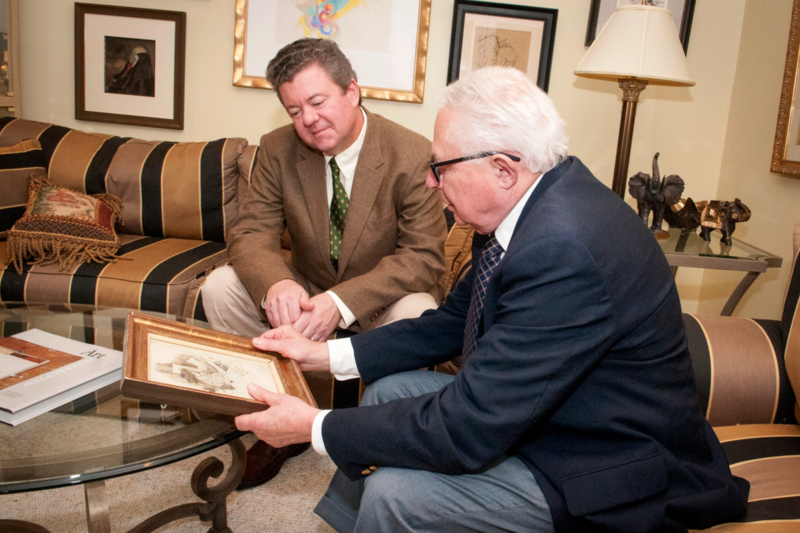 Collectors Larry Geber and Robert B. Ekelund, Jr., both Auburn professor emeriti in history and economics, respectively, attribute their present day interest in collecting to their early years. 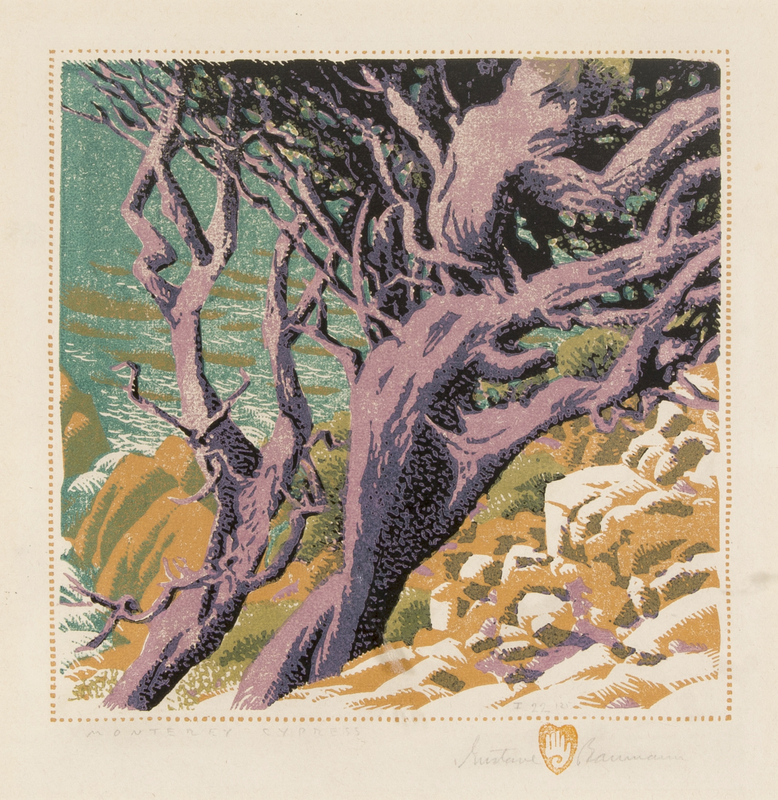 For Gerber, he became a collector first with baseball cards; seashells and prints of English castles captivated Ekelund’s interest as a youth. Gerber expanded his boyhood hobby more recently to prints, sculptures, and engravings; but he said nothing compares to his passion for rugs. He purchased his first rug for home decoration, but then eventually through antique markets in Atlanta and the advent of Ebay, he discovered Caucasian rugs and developed his collecting focus. For Ekelund, collecting evolved into what he describes today as an integral part of his life. “My interest in art continued as an undergraduate when I took as many classes in art and ancient and medieval history as were offered. I majored, however, in economics,” Ekelund said. This career path brought him to Texas A&M University, where he developed a focus on Mexican art during visits to Mexico. 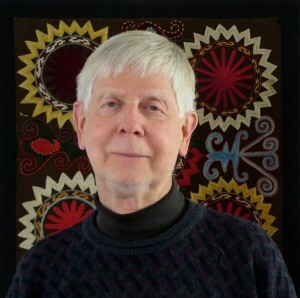 While at Auburn University, he continued collecting in this area and became involved with Jule Collins Smith Museum of Fine Art as a faculty representative in the museum’s inception and later as interim co-director. Through contacts with historians and other collectors during this time, he and his spouse Mark Thornton began a focus of pre-1950 art by Americans and artists who settled in America, amassing a collection of oils, watercolors, drawings, and prints. Public programs in June associated with the Caucasian rug exhibition include a gallery talk, a hands-on weaving studio, Georgian film screenings, lectures, and an opportunity for the public to bring in their own rugs for a historical and cultural assessment. 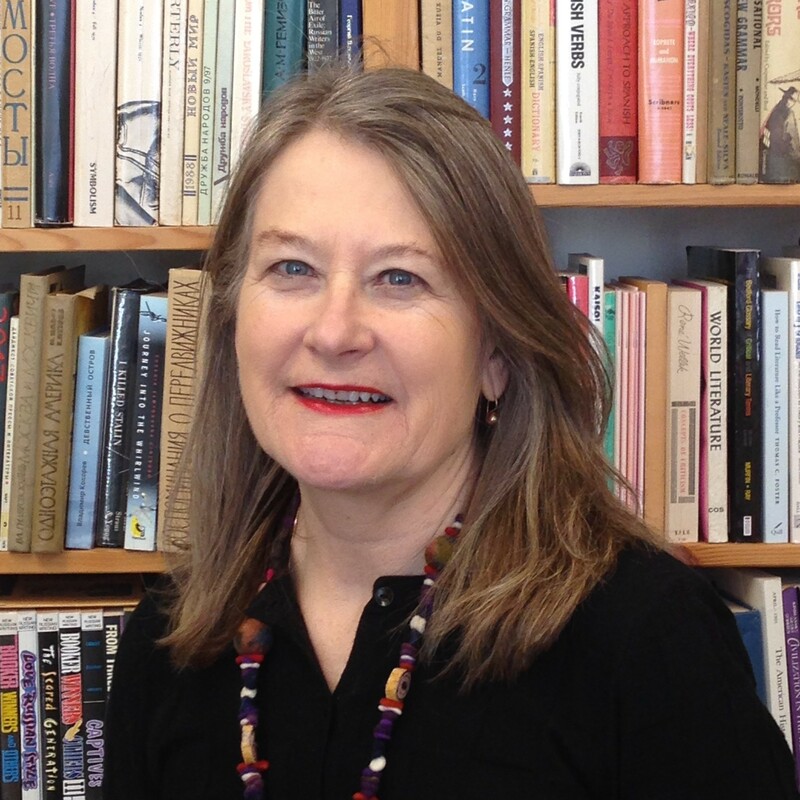 July programs associated with “The Greatest Poem” include a gallery talk, a lecture on American Modernism, and films featuring New York City and urban life. The programs are free, with advance registration encouraged online. Regular museum admission is free courtesy of JCSM Business Partners. We have wonderful exhibitions scheduled for the summer of 2015 that feature two very different but equally treasured personal collections. We look forward to “The Greatest Poem”— American Art in the Robert B. Ekelund, Jr. and Mark Thornton Collection, which features a selection of paintings, prints, and drawings by such important American artists as Winslow Homer, George Bellows, and Arthur Dove. We also are excited to present Between the Black and Caspian Seas: Antique Rugs from the Caucasus, Selections from the Collection of Larry Gerber. This exhibition will introduce our audiences to the handmade weavings of this region of western Asia. For centuries, this region has supported a diverse and rich history with influences from Byzantium, Islam, Central Asian Turks, as well as the Ottoman Empire and Europeanized Imperial Russia. We are grateful to our local collectors who have graciously made these special exhibitions available to our audience. Drivers of large trucks may know all too well that finding the right parking spot can sometimes be an adventure. Imagine positioning an antique truck measuring more than 11 feet high by 25 feet long, weighing in at an estimated 12, 000 pounds. 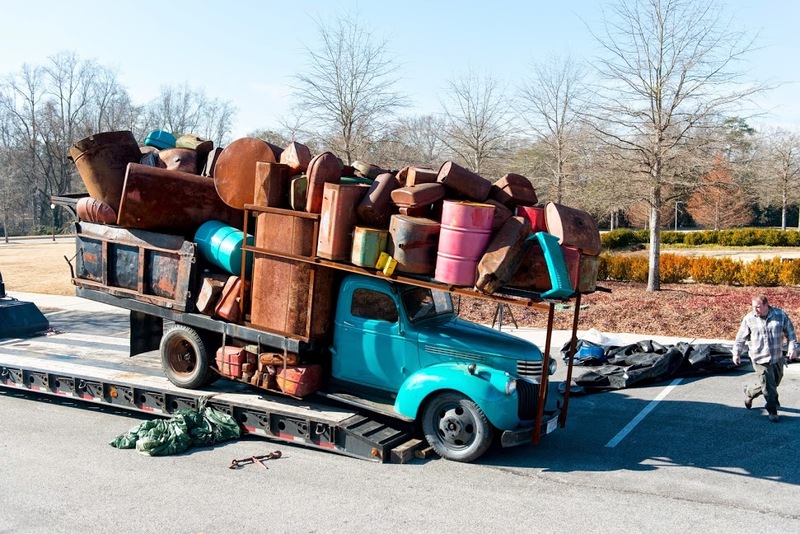 Penelope Awaiting Her Chamberlain is an outdoor sculpture created from a 1946 Chevrolet farm truck and found objects. 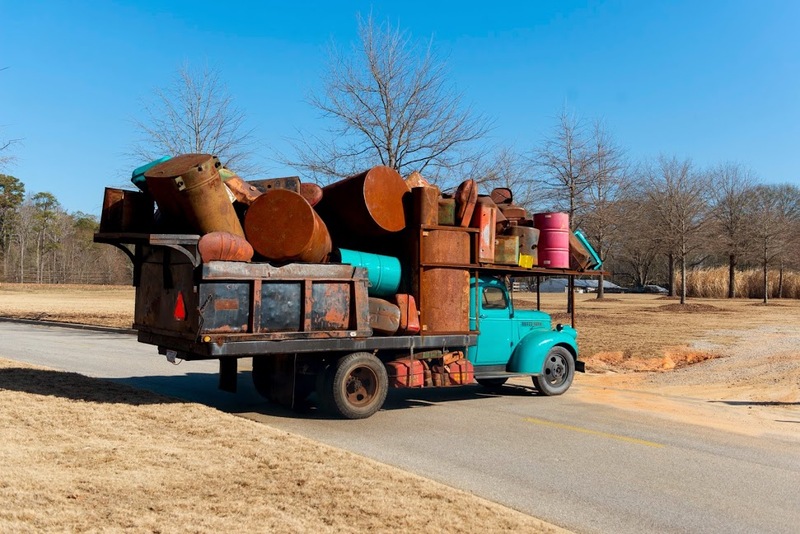 “This artwork is part of John Himmelfarb’s exhibition and reflects our ongoing interest in outdoor sculpture on the museum’s grounds,” said Marilyn Laufer, director. 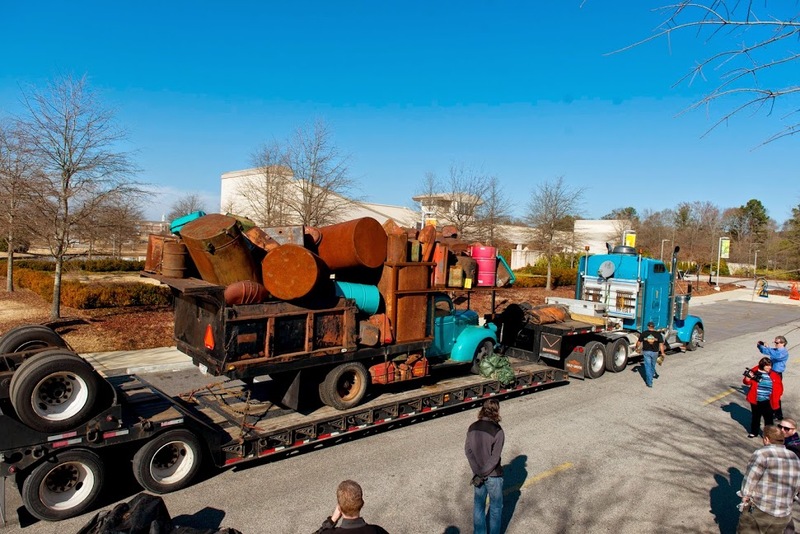 This first piece of artwork arrived by tractor trailer at the museum. 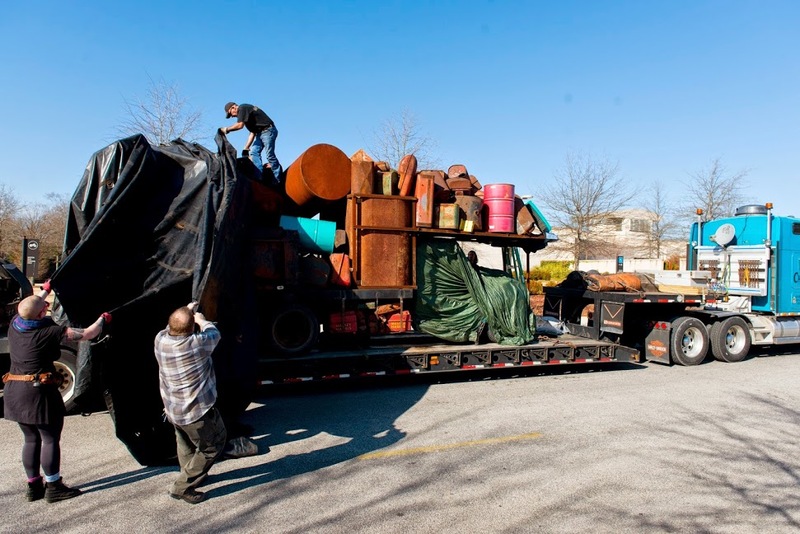 The driver unloaded his carry and drove the truck to the installation spot on the museum grounds. 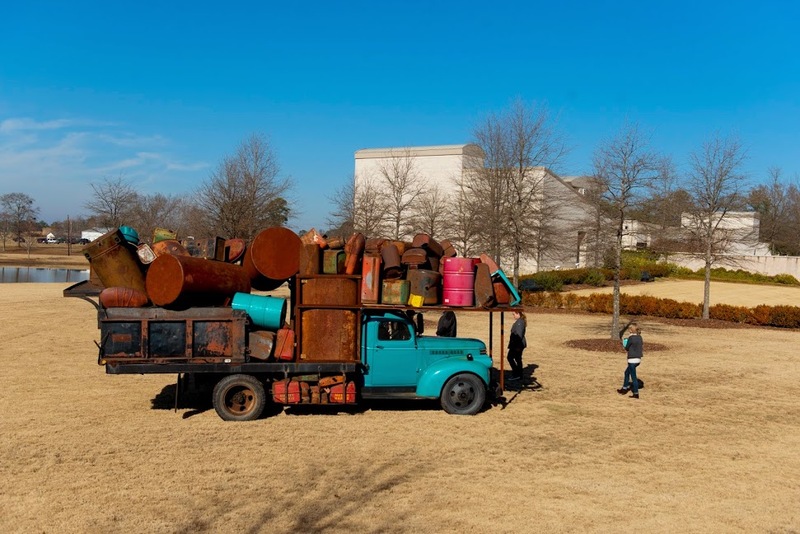 In addition to sculpture, the Chicago-based artist depicts the truck in paintings, drawings, and prints. His artwork is found in the permanent collections of the High Museum of Art in Atlanta, Georgia, the Museum of Modern Art in New York City, the Smithsonian Museum of American Art in Washington, DC, and Auburn’s Jule Collins Smith Museum of Fine Art. 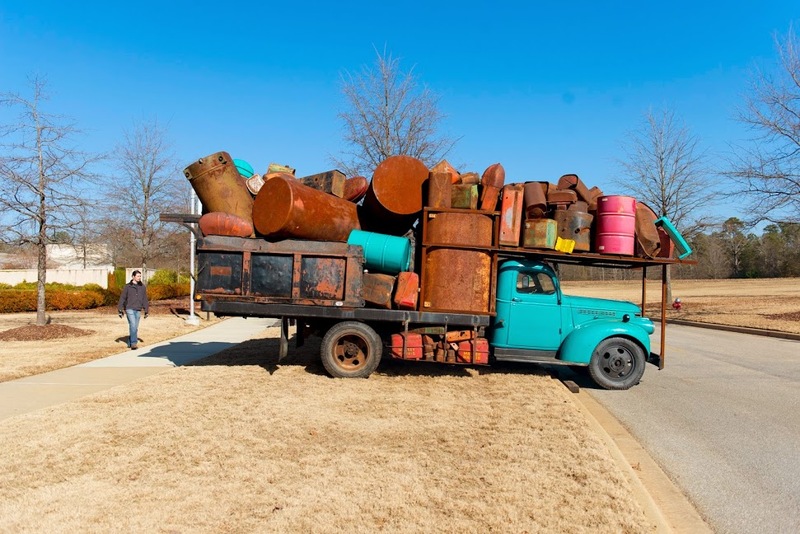 When asked about his subject matter choice, Himmelfarb noted, “Does anyone ask the artist of still lifes, ‘Why apples?’ Now, I turn the ‘why trucks?’ question around and ask: What do you think about when you see these works?” The artist went on to say his aim in doing so was to encourage the personal discovery that comes from experiencing fine art. 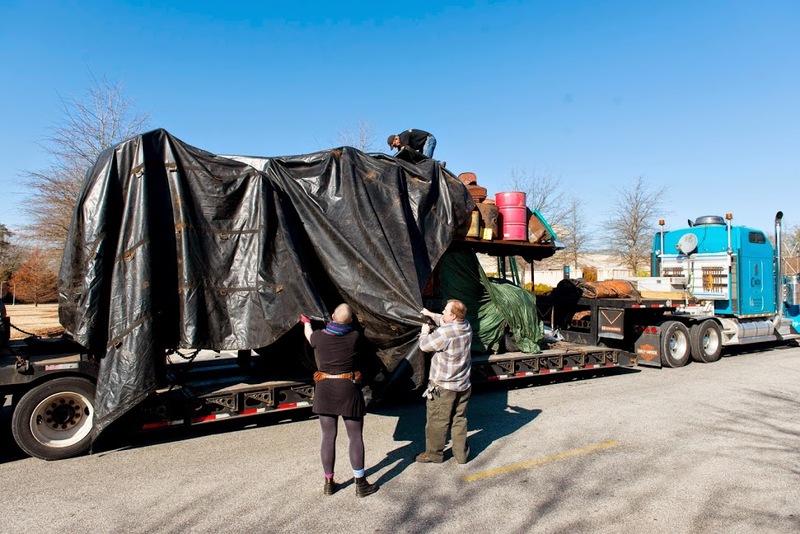 The early installation of Penelope Awaiting Her Chamberlain on the museum grounds is a sneak preview of what you will see when the exhibition opens inside the museum on Saturday, Jan. 24, 2015. The exhibition will continue through Sunday, May 10, 2015. Climbing the sculpture is strictly prohibited. 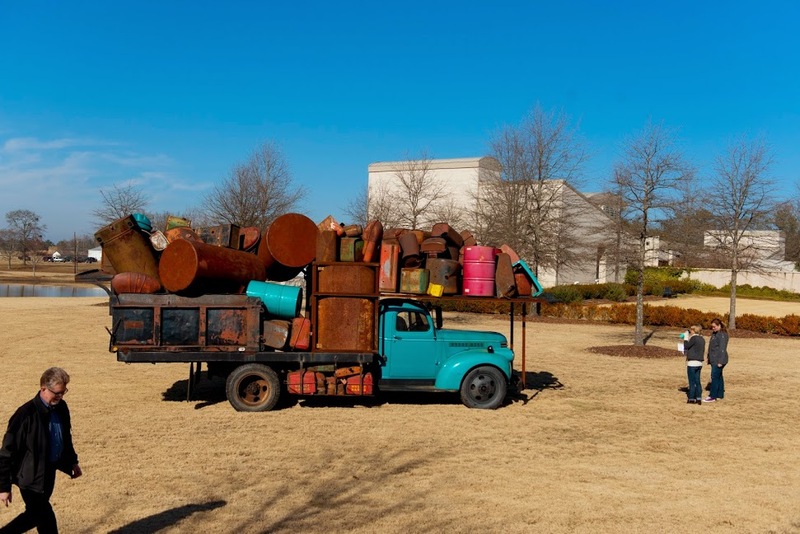 Visitors to the museum are encouraged to take photographs with the piece and post on Instagram, Twitter, and Facebook using the tag, #JCSMTruckStop. The museum is open to the public for regular hours through Sunday, Dec. 21. The holiday schedule during the university break is: Friday, Dec. 26 to Saturday, Dec. 27 from 10 a.m. to 4 p.m., Sunday, Dec. 28 from 1 to 4 p.m., and Friday, Jan. 2 to Saturday Jan. 3 from 10 a.m. to 4 p.m., Sunday, Jan. 4, from 1 to 4 p.m.
Jerome Myers: Raising Hope in the New World closes Sunday, May 4, 2014 at 4:00 pm at Jule Collins Smith Museum of Fine Art, Auburn University. For the spring semester, art history students from Auburn presented A Little Art Talk and prepared blog posts based on their presentations. Below is a guest blog on a painting from the Myers’ exhibition. A Little Art Talk continues through the summer 2014 on Wednesdays at Noon with museum staff and docents. Admission to the exhibition is free courtesy of JCSM Business Partners. A catalogue is available for purchase in the Museum Shop. Jerome Myers was born in Petersburg, Virginia in 1867, but spent nearly his entire life in large cities in the northeast such as Philadelphia and Baltimore, before finally settling on New York City. Myers drew his inspiration for his paintings, drawings, writings, and other works from the urban landscape with which he was so familiar and about which he was deeply affectionate—leading him to become one of the driving forces of the Ashcan School. The Ashcan School revolved around urban life and scenes; specifically those scenes which were set in areas of New York City. Street Carousel exemplifies these traits. The early twentieth century movement of the Ashcan School can be read as a reflection of the mid-nineteenth century Hudson River School movement in which vast expanses of raw, untouched land were painted in idealized and romanticized ways; the Ashcan School painters interpreted American beauty in their own ways. Whereas the standard for a beautiful representation of American land had so recently been the mystique of the untamed areas, Ashcan painters helped redefine and represent what was at the heart of American culture fifty years later: an urban identity driven by industrialization. Many Ashcan paintings illustrate different aspects of urban American life in this time; we see dirty workers, we see excited children, we see loose animals, and we see the ever crowded and constantly moving streets of the city. Street Carousel, painted in 1906, illustrates an extremely energetic street scene that is, in some respects, timeless. Myers’s scene feels like something that one could experience today, one hundred and eight years later, when walking around neighborhoods in New York City. Even if the viewer is not intimately familiar with the neighborhoods present in these paintings, Myers’s environments create a sense of familiarity as if one had lived in New York his or her entire life. Nevertheless, the presence of this painting is subtle at first, but almost seems to become overwhelming once you spend time viewing it. Myers creates a sense of energy with his style of painting. 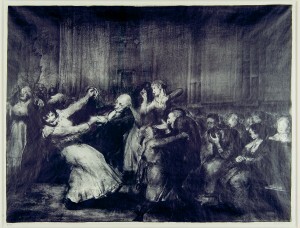 His use of loose brushstrokes lends to the action that each character is performing; the children on the carousel nearly blend into one another as they rapidly spin, the people hanging outside of their windows seem to be simultaneously emerging from and retracting into their rooms, and the two older women in the bottom left laugh and shrug as they gossip and chatter. Even the buildings themselves seem to be moving within the scene in a way; they are not by any means tall buildings, but Myers stretches them up into the sky in a strange and almost paradoxical way which allows them to stand high above the action while still seeming compressed upon themselves. Dissecting the color palette of the painting, however, seems to tell a different story. Although there are some noticeable and seemingly vibrant hues in the piece, the colors Myers employs are overall muted and almost neutral in nature throughout the painting, and in fact the colors which seem the brightest, when placed alone out of context, are mostly dull. With this in mind, it seems even more impressive that Myers is able to fill the canvas with such life and energy using such a limited gamut of colors. It is remarkable even more still when you realize that even though you are unable to make out defining features of the different people present in Street Carousel, it is inarguable that every figure within the piece—human or not—has a robust personality all its own. Even the sky—which is simply composed of a drab grayish expanse behind the rooftops—seems to be actively participating in the scene rather than just falling behind the buildings, by carefully creeping along the jutting edges of the tops of the buildings and peering in over all of the street-goers, full of curiosity. The buildings themselves seem to have competing personalities as well. Of the two front most buildings, the left building seems to be shying away from the action by falling into a slightly darker shade and having each of its windows mostly obscured by curtains while its bottom half hides behind the fabric tents of street vendors. In contrast, the building on the right seems to be desperate to join us in the street, jutting just slightly more forward than its counterpart, having each of its windows surrounded by shutters flung open, only allowing itself to be obscured by the actual carousel, and having an additional set of windows at its top which seem to act as eyes, peering down longingly into the excited street below. Myers, Jerome. Artist in Manhattan. New York City, NY: American artists group, inc., 1940. Print. The museum offers special thanks to the late Helen Farr Sloan, widow of artist John Sloan; attorney Jerome K. Grossman; Katherine Degn and Carole Pesner of the Kraushaar Galleries; and, Myers’ grandson, Barry Downes. 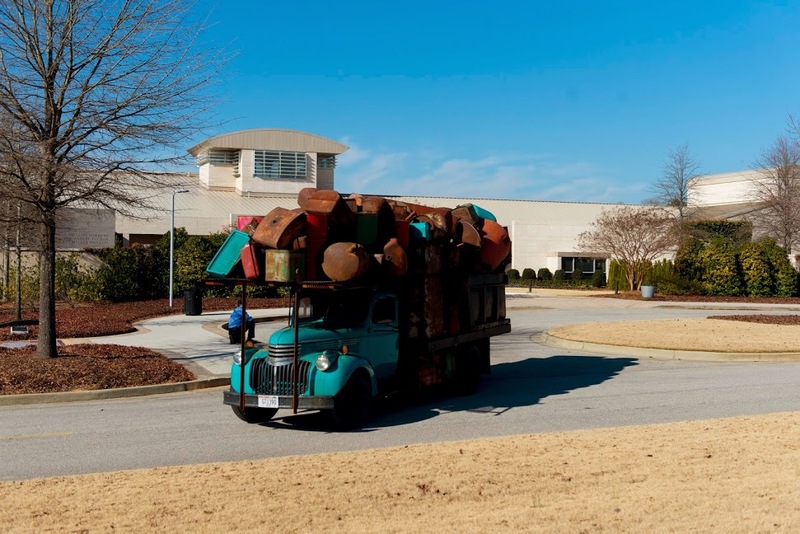 Lenders to the exhibition include the Columbus Museum, Columbus, Georgia; Delaware Art Museum in Wilmington; the Georgia Museum of Art at the University of Georgia, Athens; Arkansas Art Center, in Little Rock; and collector Samuel Rosenfeld. Jule Collins Smith Museum of Fine Art is a charitable nonprofit organization that enhances life-long learning and community enrichment. Shared Vision: The Sondra Gilman and Celso-Gonzalez-Falla Collection of Photography is on view through Sunday, April 27. JCSM director Marilyn Laufer suggests you make a point to experience the work of Garry Winogrand before the exhibition closes. Currently on view at JCSM is an extraordinary exhibition entitled Shared Vision: The Sondra Gilman and Celso Gonzalez-Falla Collection of Photography, which features 150 photographs that provide a comprehensive overview of the fine art of photography over the last century. Included are images that with time have become classic icons as well as those that are less known. There are breathtakingly beautiful images such as Paul Caponigro’s Redding Woods from 1968 and others that are challenging like the eerie portraits of children by Loretta Lux and still others that are quite unsettling such as the images by Joel Peter Witkin. This exhibition provides the viewer with an opportunity to see firsthand the diverse subjects, techniques and possibilities of modern photography – especially very recent work. One of the artists featured in this exhibition is Garry Winogrand, who died of cancer in 1984 at the age of 56. The three Winogrand images in the current exhibition are not going to grab your attention at first, and this is why I am directing attention to them, as I do not want you to miss this subtle genius. Wielding a 35 mm Leica as an extension of his eye, the artist absorbed all aspects of the world he encountered while walking or driving through America. Winogrand was a vastly productive artist who could expose a roll of film in the short time it took him to cover one city block. Those many rolls of exposed film would then sit for a year or so before he would develop them and print them as contact sheets. He did that so when he considered the images he would be compelled by the image rather than a recent memory of making the image. From this point of reflection he would begin his process of editing – selecting the shot that captured the essence of what he wanted us to see. At his untimely death there were approximately 2,500 undeveloped rolls of film and 300 unedited contact sheets. His process not only revealed his prolific output but also points to the fact that taking the image was only a part of his photographic method. Overall it was his careful consideration of which image would best provide that delicate balance of documentation, observation, ambiguity and overtone. Winogrand’s working method is evident in the image entitled Albuquerque, New Mexico from 1960, where we see a concrete driveway leading up to an attached garage of a suburban ranch style house (street number 208) mostly cropped out of the picture. The landscape surrounding the house at right is high desert covered by sage and piñon suggesting that we are on the far outskirts of town. Emerging from the darkness of the garage is a barefoot diapered baby looking off to the left. Deeper in the shadowy space is another child in a striped shirt. The children’s vulnerability is most disturbing. There does not appear to be any adult supervision and therefore nothing to prevent either of them from wandering off into the desert or down the driveway. A tricycle lies on its side in the middle of the driveway, suggesting that both or at least one of them has at one point left the relative coolness of the garage to venture out into the desert heat. There is no doubt that the image purposely puts the viewer on edge, but why? Perhaps right outside the picture frame there are loving adults who have built this house in what will become a promising suburban enclave with good schools and playgrounds nearby. But what if the photograph reveals a more edgy meaning that building in the foothills was a bad decision made by foolish people who should not be parents. Winogrand has given us only enough information to make us take a second look as we try to decipher the narrative of this story under a big dramatic New Mexico sky. The other images are similar in presenting us with scenarios that have no certain outcome. In Central Park Zoo, New York (1962) the viewer is left to wonder if the caged wolf in the background is a metaphorical reference to the male figure as predator. He carefully places his arm behind the woman who stands close to him appearing to listen, with arms crossed defensively across her chest. Or perhaps, the caged wolf really references the idea of the couple being held captive by the sexual/ cultural mores of the time. In the image entitled New York (from the series Women Are Beautiful), 1968, we find it impossible to not to smile at the beautiful young lady holding a melting ice cream cone between her fingers and tossing her head back with uproarious laughter. Behind her in the storefront window is an empty suit that stands in sharp contrast to the overflowing sheer joy she exudes. Without a doubt she is the object, as so much of art history is, of the male gaze. But she is anything but passive and her uninhibited expression of delight seems to signify a self-assuredness that negates any authority of the observer. But then again, we do not know what exactly the reason for her exuberance is. Garry Winogrand revealed America of the 1960s to his audiences replete with the insecurities and inconsistencies of an era in turmoil and transition. The fact that they still challenge us is a not surprising. He was that good. Admission to this exhibition is free courtesy of JCSM Business Partners. Exhibitions generally change three to four times a year and are curated from the permanent collection or by outside artists, organizations, and art museums. Shared Vision was organized by the Museum of Contemporary Art (MOCA) Jacksonville, a cultural resource of the University of North Florida, curated by Ben Thompson, MOCA’s curator, and Paul Karabinis, assistant professor of photography at UNF. 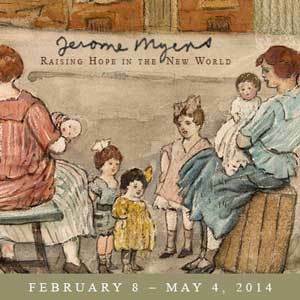 Jule Collins Smith Museum of Fine Art, Auburn University will present a select group of paintings and works on paper in Jerome Myers: Raising Hope in the New World from February 8 through May 4, 2014. Myers’ career spans the late 19th and first half of the 20th kentury, and he is considered a peer of urban realists such as Robert Henri, John Sloan, and George Luks. An illustrated publication with essays accompanies the exhibition. Charitable, tax-deductible gifts in support of the Jule Collins Smith Museum of Fine Art or other programs at Auburn are made through the Auburn University Foundation, which receives such gifts on the university’s behalf. Donors, alumni, and friends can make a philanthropic gift in support of the museum and future exhibitions. 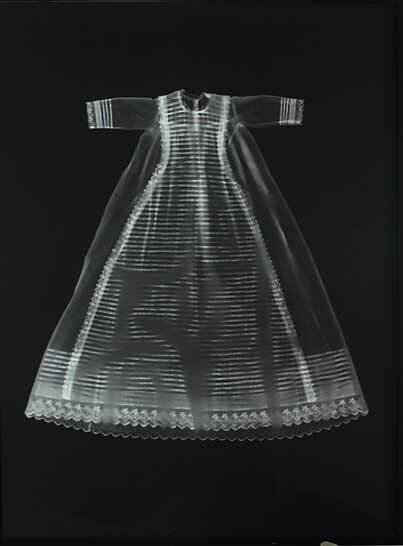 Jule Collins Smith Museum of Fine Art, Auburn University will present Shared Vision: The Sondra Gilman and Celso Gonzalez-Falla Collection of Photography, an exhibition featuring 150 images from the last 100 years of photography. The exhibition opens on Friday, January 24, 2014 and runs through April 27, 2014. Outreach programs for campus and community, including films, researcher and artist talks, and a photography exhibition of Auburn students, are scheduled during the spring semester to coincide with what many art historians consider a preeminent fine art photography collection. 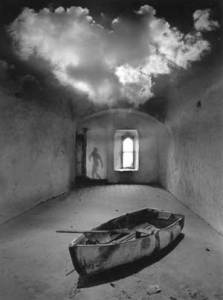 Art News ranks Gilman and Gonzalez-Falla among the world’s top 10 photo collectors. Organized by the Museum of Contemporary Art Jacksonville, the exhibition was co-curated by Karabinis and Ben Thompson. Karabinis described how they overcame what appeared to be an initial challenge—the fact that the pair of collectors did not collect a specific style or type of photography. Chuck Hemard, an associate professor in the Department of Art at Auburn, said that the Sondra Gillman and Celso Gonzalez-Falla Collection was really a college photography teacher’s dream collection, not only because of the work presented but because the exhibition is coming to Auburn versus a major art center hours away. “The collection represents an impressive variety and range of approaches to how photography can convey and express potent meanings,” he said. “To be an effective teacher, I feel an obligation to engage students with examples that represent a wide range of possibilities of what fine art photography is and can be. I love that its core seems to be resonate images by important artists. This is the part that students of art photography mustexperience, concepts that if I’m being honest, are most difficult to teach.” Hemard’s students will exhibit their photography at the museum in March. In addition to guest lecturing, Karabinis will attend the opening reception and member preview on Thursday, January 23, 2014. Those interested in joining Auburn’s art museum and attending should click ‘join’ below or call Cindy Cox, membership officer at 334-844-3005. A schedule of benefits and values is available on the museum’s web site or by request from the museum office. An edited interview from several between Sondra Gilman, Celso Gonzalez-Falla, Charles Gilman III, and exhibition curators Ben Thompson and Paul Karabinis. The full interview is available in the exhibition publication on sale in the Museum Shop. Reprinted with the permission of curator Ben Thompson. Paul Karabinis: Sondra, you have been collecting for some time.You’ve talked about how it is an emotional and physical “feeling in [your]stomach” that draws you to a particular image. Can you elaborate onthis? Sondra Gilman: The feeling is still the same as when I first started.Early on, there was not that much of a photography world. In the yearssince, I’ve been exposed to a lot. All that input—everything you read,everything you see—is in your brain. But there is another dimension: it’semotional. It touches something in my heart. That is where the feelingcomes from. I just think you fall in love. We try to verbally describe art,and it’s not a verbal experience. The end result is a love affair. PK: You have led the Photography Acquisition Committee at theWhitney Museum of American Art, where there is a curator position andgallery in your name. Talk a little about the strategies of collecting and of beginning a collection at theWhitney. SG: A lot of it is just practical. When I was appointed Chair of the Photography Acquisition Committee at theWhitney, it was the start of photography collecting at the museum. The field was so big. It was an open worldas to what we were going to collect and what our philosophy would be. David Ross was the director of themuseum, and Leonard Lauder was the head of the board, and they understood the importance of photography.We searched out people who we knew shared the same interest. Some of the strategy was defined by wherewe were in time. In other words, we couldn’t go back and collect early-nineteenth–century works and expect tohave an in–depth collection; what was really available to us at that point was photography from 1975 on.Works from before 1975 were acquired as the opportunity presented itself, but the concentration wascontemporary. We would go back and fill in if there was a gift or there was an auction and the price wasn’t through the roof. PK: Your personal collection actually began with the purchase of three Eugène Atget prints that were being deaccessioned by the Museum of Modern Art. When was this? SG: It was in the mid-1970s. Celso Gonzallez-Falla: You bought the Atget prints when you added photography to the Gilman Paper Company Collection. SG: Yes, both photo collections started around the same time. I had seen the Atget exhibition at MoMA. Thisstarted both my collecting for myself as well as my collecting for Gilman Paper Company. I thought this wassomething the company should have. At the same time I would buy something for myself, I would buy something for Gilman Paper. PK: Were there different collecting strategies? SG: No, I thought of it as one collection. CG-F: The Gilman Paper Company Collection changed when Sondra sold her interest in Gilman Paper; their collection became more focused on the nineteenth century. SG: Yes, when I did it, I concentrated on the 20th century, but the focus didn’t really change until my husband, Charles E. Gilman, Jr., died in 1982. At that point, I stepped away, and Pierre Apraxine continued thecollection, and the focus moved to the 19th century. When I met Pierre, he was the curator for the JuniorCouncil, to which I belonged, at MoMA. Paul Karabinis will give his talk, “Minor Details and Small Events” at Auburn’s Art Museum on Wednesday, January 22 at 4:00 pm.